Hershey Foods Corporation headquarters, Hershey, Pennsylvania. For many Americans, the word chocolate makes them think of Hershey's. Milton Hershey, the founder of the Hershey Foods Corporation, made his first milk chocolate bar an affordable treat customers could buy almost anywhere. Today, Hershey's chocolate comes in all forms, from bite-size "kisses" to chocolate syrup and chocolate milk. Hershey Foods, however, is more than just chocolate. By purchasing other companies Hershey expanded and now sells gum, licorice, breath mints, and hard candy, with many of its products marketed around the world. In the Unites States, Hershey has become the country's leading chocolate and candy maker. Milton Hershey spent many years trying to succeed in the candy business before he perfected the milk chocolate bar. As a teenager, he worked with a confectioner (candy maker) in Lancaster, Pennsylvania, not far from his hometown of Derry Church. In 1876, Hershey opened his own candy business in Philadelphia, but that and several other efforts in other cities failed. Finally, in 1886, he opened the Lancaster Caramel Company, making the chewy candy with milk, unlike most confectioners of the time. Hershey's "Crystal A" caramels were an immediate hit. For some of his caramels, Hershey added a bit of cocoa powder, which came from the same beans used to make cocoa butter, the main ingredient in chocolate. In 1893, Hershey watched a German manufacturer of chocolate-making equipment produce chocolate bars. He bought the same machinery for his company to make chocolate coatings for his caramels. Soon, however, he decided to sell chocolate and cocoa as separate products. The next year, the Hershey Chocolate Company started as a division of the Lancaster Caramel Company. 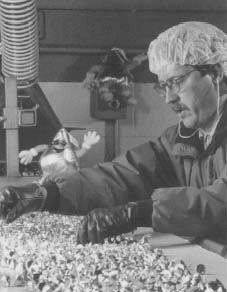 To sell his new candies, Hershey hired William Murrie. To advertise the products, he bought an electric car—one of the first in Pennsylvania—and painted "Hershey's Cocoa" on each side. Hershey not only made plain bars, he also molded his chocolate to look like cigars, miniature bicycles, and many other items. By 1900, he decided to get out of the caramel business and devote himself to chocolate. Hershey sold the Lancaster Caramel Company for $1 million and kept the Hershey Chocolate Company. He also began plans to build a new factory. For several years, Hershey made chocolate out of a rented factory while he looked for the land for his new plant. Finally, he chose a site in Derry Church. The area had many dairy farms, which was handy since Hershey needed fresh milk to make his milk chocolate. Adding milk to chocolate gave it a light color and smooth taste. The process had been discovered in Europe in 1875, but Hershey spent several years developing his own recipe for milk chocolate. When his factory opened in 1905, Hershey concentrated on selling chocolate bars at five cents each. At the time, most Americans had never tasted either milk or dark chocolate. Chocolate was expensive and sold only at candy shops or in drugstores. Hershey believed everyone should be able to afford chocolate, and they should be able to buy it anywhere. Joël Glenn Brenner, author of The Emperors of Chocolate, quotes Hershey as saying, "It is more than a sweet, it is a food." By producing huge numbers of chocolate bars, Hershey kept his prices low. He also convinced grocery stores, newsstands, diners, and other businesses to carry his bars. Then, unlike most chocolate makers, Hershey sold his bars across the United States, not just in one region. Candy maker Milton Hershey sells his first milk chocolate bars. The Hershey Chocolate Company opens its first factory in the town of Hershey, Pennsylvania. Milton Hershey donates most of his wealth to the trust that runs the Hershey Industrial School for orphaned boys. Annual sales at Hershey reach $31 million. Hershey buys the H. B. Reese Candy Company. Hershey changes its name to the Hershey Foods Corporation. Hershey runs national advertising for the first time. Hershey buys Peter Paul/Cadbury candies. Hershey announces record quarterly sales. Directly around his plant Hershey built a new town, with homes for his workers. The town of Hershey grew to include a school, stores, an amusement park, and a zoo. Hershey provided the heat, water, and electricity to the town's residents, and no one paid taxes. In 1909, Hershey and his wife Catherine opened the Hershey Industrial School, which educated orphaned boys. With his town and school, Hershey became known as one of America's most generous businessmen. The success of Hershey's chocolate bars fed that generosity. So did a new product introduced in 1907: Hershey's Kisses. By 1911, annual sales at the company reached $5 million. Hershey was not involved in most daily operations, leaving that to Murrie, his first salesman and close friend. After November 1918, Hershey did not even own the company bearing his name. When his wife died, he gave his estate to the Hershey Trust, which had been set up to run the Industrial School. The Hershey Company sold shares to the public starting in 1927, but the trust remained the principal owner. 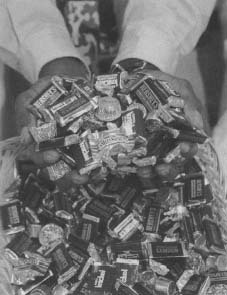 The Hershey company introduced several new chocolate candies during the 1920s and 1930s. First was Mr. Goodbar in 1925, a chocolate bar with peanuts. Krackel, chocolate and crisped rice, hit store shelves in 1938, and Hershey Miniatures appeared the next year. The company also provided the raw chocolate used by other confectioners for their candies. Sales grew even as the United States struggled through the Great Depression of the 1930s, the economic downturn that threw millions of people out of work and left many hungry and homeless. 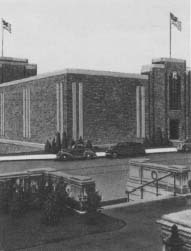 When it opened in 1905, the Hershey plant was the most modern candy factory in the world. By 1915, the company was producing more than 100,000 pounds of chocolate every day. The plant remains the world's largest chocolate factory. The Depression stirred some industrial workers who did have jobs to form unions. The unions tried to win higher pay and better working conditions for workers. Strikes and violence broke out at some factories, including Hershey's. Workers closed the plant and demanded the company let them join a national union. The strike ended several days later when area dairy farmers, angered because they were losing money as the factory sat idle, attacked the strikers. Hershey eventually agreed to let the workers unionize. Chocolate goes through many different stages of processing before it is packaged and sold. More changes followed in the 1940s. Hershey died in 1945, and Murrie retired two years later. By then, the Hershey Chocolate Company controlled 90 percent of the milk chocolate market in the United States. During the 1950s, however, the company seemed to lack direction. Competition increased, and companies in Europe were streamlining their production with new equipment. Hershey also did not advertise, following the long-held belief of Milton Hershey: "Quality is the best kind of advertising." The company finally began to modernize in the early 1960s, under the leadership of Samuel Hinkle. Hinkle added new equipment to speed up production and opened Hershey's first foreign plant in Canada. In 1963, Hershey grew with its purchase of the H. B. Reese Candy Company, famous for its chocolate-and-peanut butter cups. The company also moved beyond candy in 1966, with the purchase of pasta makers San Giorgio and Delmonico Foods. To reflect its new products, the company changed its name in 1968 to Hershey Foods Corporation. Two years later, Hershey advertised for the first time, placing ads in newspapers and broadcasting ads nationally on radio and television. The advertising was a response to Hershey's slipping sales, primarily to its major U.S. competitor, Mars, Inc. Advertising and marketing increased under William Dearden, who took over as chief executive officer (CEO) in 1976. Dearden also continued to move the company beyond chocolate manufacturing. By 1979, Hershey had bought several more pasta companies, the largest U.S. licorice manufacturer, and Friendly's, a chain of family restaurants that specialized in ice cream. (Hershey sold Friendly's in 1988). By 1982, about 30 percent of Hershey's $1.5 billion in sales came from non-candy products. Hershey's Miniatures, first made and sold in 1939, have been popular ever since. In 1982, Hershey Foods scored a major victory in its chocolate "war" with Mars. The competitor turned down a chance to have its M&M candies featured in a new movie by director Steven Spielberg (see Dreamworks SKG entry). Hershey's, however, jumped at the opportunity to promote a relatively new product, Reese's Pieces. The movie was E.T: The Extra-Terrestrial, which became one of the most popular films ever. One Hershey executive said in The Emperors of Chocolate, "It was the biggest marketing coup in history.… We got immediate recognition for our product, the kind of recognition we would normally have to pay fifteen or twenty million bucks for." The success of Reese's Pieces and several other new products, plus the 1988 purchase of the U.S. interests of British candy maker Cadbury Schweppes PLC, helped Hershey regain its spot as the top American candy company. Hershey also expanded its presence in Europe, buying a plant from a German company in 1991. Since the early 1990s, Hershey has continued to battle Mars for the top spot in chocolate manufacturing. It has introduced successful new products, such as Hershey's Hugs (Kisses made from white chocolate) and Reese's NutRageous bar. The company has also bought other candy companies, including Leaf North America, the maker of Jolly Rancher hard candies. And Hershey's has sometimes worked with other companies to market products with the Hershey name. In 2001, an economic downturn hurt sales in many industries. Hershey, however, announced record sales in the third quarter of that year, a little more than $1.3 billion. Still, the company announced job layoffs and the closing of several plants. Hershey's and other chocolate makers also faced bad publicity that year. Several newspapers reported that some of the raw cocoa used to make chocolate is picked and processed by children held as slaves on farms in several African nations. In November 2001, Hershey and other U.S. chocolate companies announced they would start a program to eliminate the abuses. During World War II (1939-45), Hershey played an important role in giving U.S. soldiers the energy they needed on the battlefield. After World War I (1914-18), the company worked with U.S. officials to design a chocolate-based bar loaded with nutrition and calories. The end result was the Field Ration D, a bar that mixed oat flour and vitamins with chocolate. Unlike regular chocolate, the new bar would stay solid at up to 120 degrees Fahrenheit, and inside its special packaging it stayed dry for up to an hour when placed in water. Hershey's made more than one billion of these rations, and U.S. soldiers carried the Hershey name all over the world. The military continued to use the Field Ration D until the 1970s. Hershey chocolate went to war again in 1990, as U.S. soldiers prepared to fight in the Persian Gulf War (1991). Hershey developed a chocolate bar that would stay solid at temperatures up to 140 degrees Fahrenheit—perfect for the hot desert climate of the Persian Gulf area. Unlike the World War II bars, however, these "Desert Bars" tasted just like a regular Hershey bar. The company sent almost a million Desert Bars overseas and also sold them at home. Despite its problems, the Hershey Foods Corporation remains on top in the chocolate and candy industry. It continues to expand its efforts overseas and roll out new products designed to tempt the sweet tooth of candy buyers everywhere. I love chocolate, but have been forced to stop buying most of your products. I'm very soy intolerant. Unfortunately, you're adding soy, in one form or another, to almost everything. More people than you know have difficulties with soy. Please remove it! I miss all the things I used to eat.